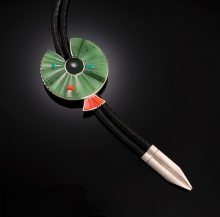 For the first time in his more than 40-year career, Richard Chavez’s jewelry is featured in a retrospective exhibition. Since his early years of jewelry design and execution, Chavez has continued to painstakingly make each item by hand. An artist who enjoys designing, Chavez places an emphasis on stone selection, placement and presentation. 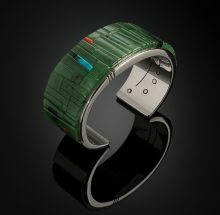 Now, some 40 years since he first tried to solder metals, Chavez is one of the Southwest’s leading jewelers, whose works are recognized for complex inlay, architectural sensibilities and striking color patterning.